I do so love giving gifts. One of my love languages is just that, Gift Giving. 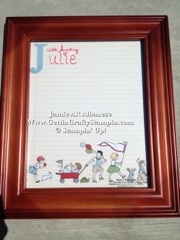 I have this great lil gift that I love to make, personalize n give away. With school starting up in the next few weeks, I'm making one for each of my kids teachers! Find a lovely paper to use, Iiiii used the Storytime DSP as its designed with lines and has the cutest kids running across the bottom. I cut it down to fit the 8x10" frame size (it's great for smaller frames too!!) 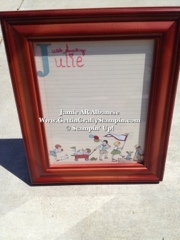 and I add an initial or stamp and reframe it up. Gift it with a Dry Erase Marker it Vis erase (requires water and is myyyy preference). I love to write a note or a quote for the recipient of this gift. Easy, peasy, lemon squeasy. Lol. I made this for our schedules, for our kitchen, smaller ones for menu explanations at parties, etc. Get creative n have Fun! I haven't had one person who hasn't loved receiving it. 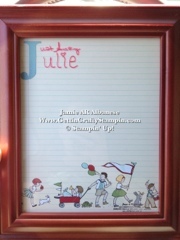 You can really personalize with styles of frames, stamps, papers, embellisments, etc! that is a great gift idea, thanks for sharing! Great idea! I will have to make some. I KNOWWWW this is ideal for almost anyone you know! Easy n fun! Thanks for popping by! Love it! Awesome gift idea. I know lots of people who would love one. What a great gift and a perfect teacher gift. I will have to make one of these. Thanks for sharing and hope you put into our member folder for our back to school challenge this week over at LNS. You are right. This is the perfect gift! Awesome job. I just love these and a teacher would really find them useful! Thanks for joining the challenge! Sweet! 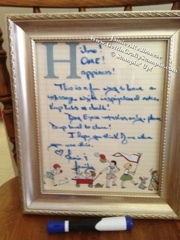 I bought frames to make these but haven't gotten around to it yet--you may have motivated me, lol! Too many ideas and not enough time! Great project thanks for playing along with our challenge this week!